The State Government and the Adelaide City Council have unveiled an expansive action plan to make Adelaide a carbon neutral city by 2025, relying heavily on massive carbon emission reductions from city buildings. The Carbon Neutral Action Plan, to be released this afternoon, projects a 65 per cent reduction in emissions from the CBD and North Adelaide by 2025, with the balance of that year’s emissions – more than 400,000 tonnes – to be accounted for by purchasing offsets. The plan says the purchase of conventional fossil-fuel buses will be phased out within 10 years, cycling trips will be doubled by 2020, public transport use will increase, and, by 2050, the state’s electricity supply will be almost completely “decarbonised”. “The [emission reduction] measures alone cannot reduce our emissions to zero in the near term, therefore becoming the world’s first carbon neutral city will require the remaining emissions to be offset,” the report notes. It gives no indication, however, of the expected cost of purchasing the offsets, or how the yearly offsets budget may be split between the Government and the council. But it reveals that the State Government is pushing for an electricity interconnector between South Australia and New South Wales – and that it has plans to turn Grenfell Street and Currie Street into “a transit pedestrian precinct” by 2020. It is unclear what the latter plan means for motor vehicle transit along that route. Though the plan relies heavily on emissions reductions from city building energy use, it concedes that “most buildings in the city are privately owned and therefore beyond the direct influence of the State Government and Council”. “Our roles are therefore to provide support and facilitation, and to lead by example through aggressive energy efficiency measures in our own operations,” it says. According to the plan, commercial and apartment buildings are the city’s largest consumers of electricity, accounting for 48 per cent of total emissions in 2015, but electricity consumption in the sector has been declining since 2007. A key driver of city building emissions reductions is a public-private program, ‘Carbon Neutral Adelaide Partnerships’, to which the Government hopes to sign up 1000 city businesses, covering one million square metres of city floor space, by 2020. Under the plan, businesses will be offered incentives to drive down carbon emissions. Adelaide University is the first major institution to sign up to the program. Vice Chancellor Warren Bebbington said the university was leading by example though its participation in the program. “As first major partner in the Carbon Neutral Adelaide initiative, our Campus Sustainability Plan will reduce carbon emissions, improve energy efficiency, and continue to engage our staff and student community in sustainability,” he said. The plan also cites Building Upgrade Finance legislation – that passed State Parliament last year – which helps building owners access commercial loans to fund environmentally friendly building alterations. Having one million square metres of city floor space committed to ‘Carbon Neutral Adelaide Partnerships’ by 2020. Ensuring South Australia’s electricity supply is “almost completely decarbonised by 2050”. Having 20 per cent of City office floor space – about 400,000sqm – participate the ‘CitySwitch Green Office Programme’ by 2021. Delivering a ‘renewable energy bulk purchase scheme’ by 2018. Phasing out the purchase of conventional fossil fuel buses by no later than 2025. Developing a ‘Green City Plan’ to increase city greening through trees, gardens, plantings, green walls and green or cool roofs by the end of 2017. Upgrading all Council owned public streetlighting to high efficiency LEDs by 2020. Developing a carbon sequestration strategy for South Australia by December 2017. This is expected to form a key element of the city’s offsets strategy, which prioritises offset projects “based in South Australia and Australia”. There are not yet any accredited emission offset businesses in SA. Increasing the use of public transport to 10 per cent of weekday passenger transport kilometres by 2020. Doubling the number of cycling trips in the city by 2020. Increasing the number of publicly accessible electric vehicle recharge points in the city to 250 by 2020. Converting half the city’s commercial car park floor space to high efficiency lighting systems by 2021. Planting 1000 trees in built-up areas of the city by mid-2020. Premier Jay Weatherill said in a statement this morning that the City of Adelaide is “already known as a clean and green, vibrant and liveable city and becoming carbon neutral will provide further incentives for investment into our city and the state and create opportunities for local business”. “Adelaide is full of dynamic, committed businesses, community groups and individuals who are working to improve sustainability and the Carbon Neutral Action Plan 2016 – 2021 will further build on our reputation as a world leader in climate change action,” he added. Lord Mayor Martin Haese emphasised the economic opportunities associated with reducing carbon emissions. “There is clearly an environmental imperative to reduce carbon emissions [in the plan] but it also presents a strong economic opportunity for Adelaide and South Australia through innovation and investment opportunities and the growth of green industries and jobs,” he said. 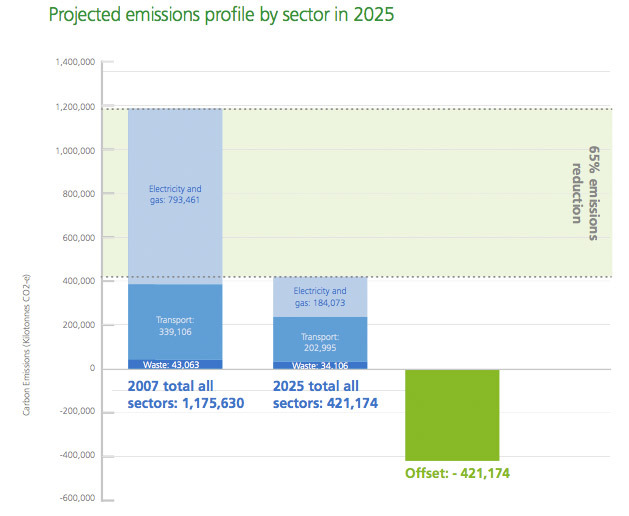 This graph electricity and gas emissions reductions from commercial and residential buildings in the city, and carbon offsets, are the key drivers of the Carbon Neutral Action Plan. But Haese will have to work hard to convince his council of the merits of the carbon offsets – which are vital to the plan – after the council unanimously voted in September to delay any purchase of carbon offsets until “after all cost-effective and reasonable measures to reduce city emissions have been exhausted”. The plan confirms previously released modeling, showing that carbon neutrality for the city of Adelaide would be out of reach for several decades at least without the purchase of carbon offsets. Modelling in the Carbon Neutral Adelaide Foundation Report showed that exhausting “all cost-effective and reasonable measures to reduce city emissions” is a decades-long project. And, in order to keep Adelaide’s emissions at net-zero levels, Haese said earlier this year, carbon offsets will have to be purchased on an ongoing basis, every year. According to the plan, out of the five sources of City of Adelaide emissions – commercial and apartment building energy use, residential energy use, electricity transmission and transport – transport emissions may be the most difficult to bring down. The document describes five pathways to carbon neutrality. “Reducing transport emissions may be the greatest of our emissions reduction challenges, due to the complexity of the transport options available, the high cost of zero carbon vehicles, and the significant influence of affordability and demographics on individuals’ transport choices,” it says. Under a “low emissions private vehicle scenario” though, where consumers quickly transition from fossil fuel-propelled cars to hybrid and electric vehicles by 2025, “transport sector emissions could be reduced by 47 per cent”. The document notes that “the City of Adelaide is not alone in its ambition to be a carbon neutral city—other cities have similarly bold targets”.